Anybody who knows me well knows that I’m big on technology. My job involves computers. Lots of computers. And I can barely function without my cell phone. But for this week’s You Capture challenge, I didn’t take pictures of our (four!) computers in the house. I went for what was on our end table. 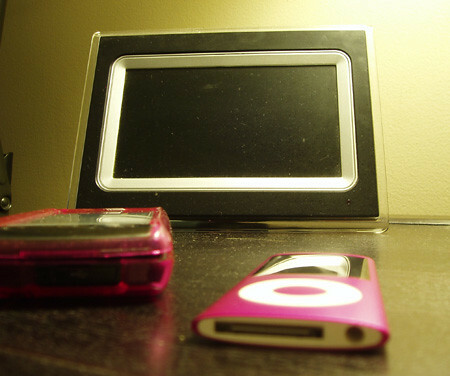 My cell phone, iPod and digital picture frame. And apparently, I like pink. We got Uncle Al (!!) an electronic frame for Christmas…. Erin downloaded lots of pictures, many from her infant to present years, and it too sits on our endtable, for all to enjoy!!! Great shot of all the different technology things! I didn’t do computers either cause I have a love hate relationship w/ then thanks to my hubs job as a DBA! The pink made me smile.